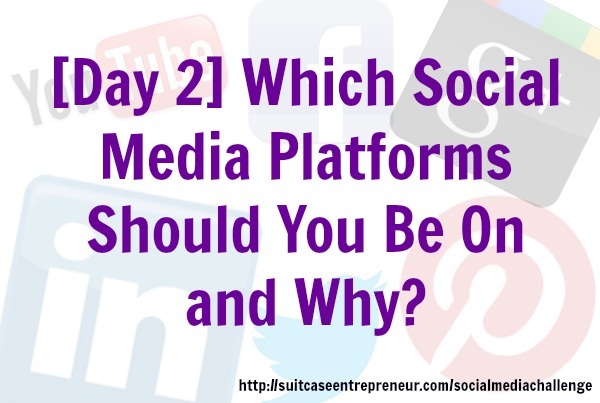 [Day 2] Which Social Media Platforms Should You Be On and Why? You want to be where your audience is. Plain and simple. Nothing more to it. Yet there’s this tendency to want to be everywhere, even if your ideal customers aren’t hanging out there. I think the term they use for it these days is FOMO – Fear of Missing Out! If you preach to yoga loving Mums, then why on earth would you spend hours on LinkedIn each day? If you’re in the financial industry selling insurance specifically to truck drivers, I can guarantee you wouldn’t have much success on Pinterest. Yet we get sucked into wanting to be `popular’ and seen everywhere. As a result, we get completely overwhelmed, can’t keep up, and end up sporadically posting across every platform with no real strategy or content plan. Basically, we get lost. So how do you figure out which platforms you should be on? As I stated, the platforms which are best for you are the ones where your customers are. I did my research and dug into the key facts you need to know about each of the main social media tools we will be covering in this challenge. I also found a great infographic by Social Media Today that I pulled more facts from to make it easier for you! Facebook is huge! It has over 1.15 billion users (and 1 million active users). Facebook is the only site I actually recommend that EVERYBODY should be on. With that many users it’s highly likely your audience is on Facebook. It’s a personal and business platform where you can connect with friends and family around the world, build your personal brand and create a mini website via a Facebook page for your business. It’s all about resonating with people and telling a story through the use of video, photo, quotes, how to and entertainment with a more personal feel. The largest audience at around 40% is the 45-54 demographic, followed by both 35-44 and 25-34. It’s slightly more dominated by male to female and main demographic is somewhat college educated earning $50-75K per annum. It’s great for freelancers, entrepreneurs, brands, organizers, advertisers and anyone who wants to connect with people, engage and ultimately convert. Facebook is one of the most versatile platforms where photos, videos, text and articles actually works really well in terms of engagement and conversion. It’s good for improving SEO, traffic to your site, brand exposure and customer engagement. Come like my Facebook page for cool updates on creating freedom in business and adventure in life, as well as latest blog posts, videos and podcasts. If your audience is at all corporate, professional or employee related, LinkedIn is a great place to be, especially if you’re in the services-based industry of coaching, consulting, copywriting, web development, business development, partnerships and recruitment. With around 200 million users it’s best used by adding value to conversations, answering questions and sharing great info that puts you as the `go-to’ authority on your subject matter, which leads to referrals and new business. The largest audience is 35-44 followed closely by the 45-54 demographic. It’s evenly split between female and male. The main demographic is somewhat college educated and also earning $50-75K per annum. It’s great for professionals in all industries; also useful for job recruiters and headhunters. Articles and texts work well on LinkedIn – both posting to your status and in relevant groups to start discussions. It’s decent for improving SEO and brand exposure. If used well, it’s a great tool for referrals and recommendations for your services. Come visit my LinkedIn Company page and see how I use it to display products, services and testimonials. I like to think of Google Plus as a cross between Quora and Facebook – it’s like an intelligent yet active and vibrant platform that is growing steadily with over 350 million users. It’s a great tool to include others in by tagging your circles where you’ve grouped people into friends, influencers, clients, community, etc and being able not only to notify them of a post but also email them – powerful, if used wisely. Like Facebook, photos, videos, articles and texts work well on Google Plus. It’s good for improving SEO, brand exposure and customer engagement especially through the use of communities and hangouts (excellent features for customer service and building trust). Come say hi on Google Plus where I’m posting the daily challenge and sharing yours. Twitter is one of my favorite tools that is a practical, useful and fun way of sharing information. Withs around 450 million users, I love it because it requires people to be succinct and get their message across in 140 characters or less! Twitter is one of the only tools where tweeting more often is actually a good thing as updates and posts go by so quickly in the newsfeed it helps to repeat yourself, and vary those messages throughout the day for your personally and your business. To attract attention, use catchy and intelligent copywriting when tweeting. You should also follow and engage with people who are key influencers or potential customers in your area of business. Twitter’s key audience is 65% female and age wise it’s evenly split between 25-34, 35-54 and 45-54. The average salary is lower at $25-50K per annum, and once again most users have some college education. News organizations, marketers, brands and advertisers use it well, and of course celebrities…. Photos, videos, and text are most effective on Twitter. Twitter is great for increasing your brand exposure, customer engagement and traffic to your website or landing pages. YouTube’s 1 billion unique users visit the video-sharing website every month, which is nearly one out of every two people on the Internet. So like Facebook, it’s a very powerful tool with a likelihood that your ideal target market is using or watching video on YouTube. It’s been great to watch personal brands really carve out a niche by sharing their knowledge through use of creative videos – whether via screen sharing (product demos or how to videos) or putting themselves on video. It’s a perfect storytelling tool. YouTube is slightly dominated by females at around 55%. The largest audience is definitely younger at 18-34, although next up is 45-54. The average salary is lower at $50-75K per annum and once again, most users have some college education. YouTube is great for mediapreneurs (brands and entrepreneurs who want to establish their authority and knowledge online), video production, vlogging, movie-making and music sharing plus cat and baby videos! Video is the most effective media to use on YouTube…obviously. YouTube is great for SEO (it’s owned by Google!) and brand exposure. I’d love for you to check out my YouTube Channel and specifically my business lifestyle travel show! This visual tool originally attracted a bunch of artists and creatives but has proved to be a powerful tool for people selling their products and services. Not just Etsy artists, jewellers and image consultants, but mediapreneurs, authors, speakers and service providers, too. Creating boards of interest that highlight your knowledge in an area as well as your interests allows you to build a personal brand and company people can really resonate with. Aside from pinning photos and videos, you can pin blog posts, articles and even products for sale. With around 30 million users and growing, Pinterest is largely dominated by females, approximately 80%. The largest audience is made up of the 45-54 age bracket earning on average $40-60K per annum with some college education. Pinterest is great for mediapreneurs, entrepreneurs, artists, creatives, service providers and e-commerce related brands. All the media formats work on Pinterest, but photos and videos are especially effective. Pinterest is great for increasing your traffic and brand exposure. Check out my Pinterest business profile here or click on the image below. By the way, if you don’t know who your target market is or how you go about figuring out how to attract your ideal customers, then I recommend you check out Am I Your Customer and pre-order your copy at 50% off of this great guide that’s due out end of September. How do you reach and engage with your target markets? Once you’ve decided on which ones are best for you personally and where your audience are, forget the rest. No, seriously do. This will allow you to really master them and get results. You can add more sites later once you understand how to use them well. Spend 30-60 minutes per day (pick a time to do this and stick to it) doing the right things like engaging with your community, sharing your knowledge, adding value and answering questions across your key social media sites. Try Free Online Stopwatch to help keep you focused. Who is your target market, which social media sites should you be focusing on and why? Share your blog post far and wide from your own blog using your own share buttons and the hashtag #SMC AND post a short description and the URL right here in the comments. Join the Social Media Club for free where we share tips and strategies for using social media. Follow the Social Media Tips Pinterest board.